The Setup command is used to modify some attributes of the currently open notes file. You can give a password to your NTF file, so it will be saved in encrypted form. Please, enter the same password in the two input boxes. You can use Clear Password to delete any password and Show Password to display the passwords in the input boxes. You can select the translit language to be used by some commands. You can specify whether text in notes information area should be displayed word wrapped or not. You can specify the Card Separator character (default is Form Feed) to be used when you save your file in TXT format. See Save... command. If you want to disable command execution from NOTEFILE, you can deselect the Enable command execution option. If you want to save a copy of your file with $$$ extension periodically, then you can specify the autosave period in minutes. To disable the autosave feature, set the period to 0 minutes. If you want to move the notes index list from right to left and the notes information area from left to right, you can select Left in Index list at. If you want to resize the NOTEFILE window, the notes information area, and the notes index list to their default sizes, please check the Reset main window geometry check box before clicking OK. If you want, you can specify a path name for a “mirror” copy of your data file. If Alt. save file name is given as a non-null string, then a second copy of your data file will be created each time you save your notes file. This will be identical to the original file. This feature is intended for problems arising outside your usage with NOTEFILE, such as disk crashes or unintentional file deletions. So, it is advised to select your alternate save file name in another hard drive, preferably on a networked computer or a removable disk. You can disable creating a backup file or you can have 1 to 9 backup files by specifying a number between 0 and 9 in Backup file count. For more information look at the end of this topic. You can change the font used for both the notes information area and the notes index list by using the Change Font... and the Default Font... buttons. Using the Change Font... button you can select any font and special font attribute present in your computer. The Default Font... button is used to revert to the build-in default font of NOTEFILE. The Quick Search Items tab can be accessed also with the Quick Search Items... command from the Search menu. The Autodial tab is used by the Autodial... command from the Card menu. After you change the setup of the file and try to close it, NOTEFILE will prompt you to save the file. File setup information is saved only in NTF formatted files. The autosave feature is useful for periodically storing a copy of the notes file being edited to a temporary file in NTF format. If the file has a password, then the temporary file will be stored in encrypted form also. For more information see the Open... command. The commands Copy ASCII and Change Case, will use special information given in the Translit File if it exists in the same directory as NOTEFILE.EXE. But before using these commands, the appropriate language must be selected in the File Setup dialog box as described above. The passwords you enter in the Password and Password (verify) input boxes must be the same. You can check this by clicking Show Password. Card Separator must be a displayable ASCII character or the Form Feed character. The Card Separator must be a single plain ASCII character in the range ! to ~ or the Form Feed character (ASCII decimal code 12). Please, do not use any international characters like éöçφЖ etc. Autosave period must be a value between 0 and 99 minutes. The value of 0 will disable the autosave feature. To enable autosave, please enter a value between 1 and 99. Backup file count must be between 0 and 9. 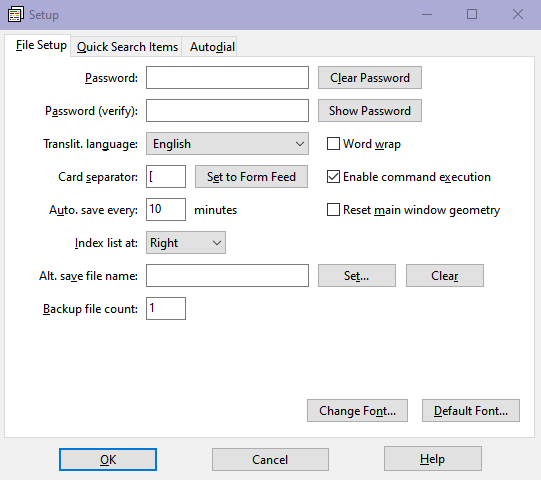 During a Save or Save As... operation, if the NTF or TXT file being saved is going to replace a file with the same name, the old version will be renamed to BAK extension, so that it will be kept as a backup file. However, a value of 0 in Backup file count will disable creating any such backup file. The default is 1, so that one version of BAK file will be saved, just like the normal behavior of NOTEFILE before version 2.01. To enable having more than one backup files enter a value between 1 and 9. Note: The most recent backup file will have the extension BAK; the others will be BK2, BK3, etc.